I find myself snacking on Vietnamese pickled jalapenos (Ot Ngam Giam) ALL. THE. TIME. Unlike other pickled jalapenos, these jalapenos are crunchy and fresh tasting, even after one month in the fridge. Like most Vietnamese pickling, this method doesn’t involve a hot water bath that cooks the vegetables. Therefore, it doesn’t last an eternity. However what lacks in perishability, makes up in the taste. 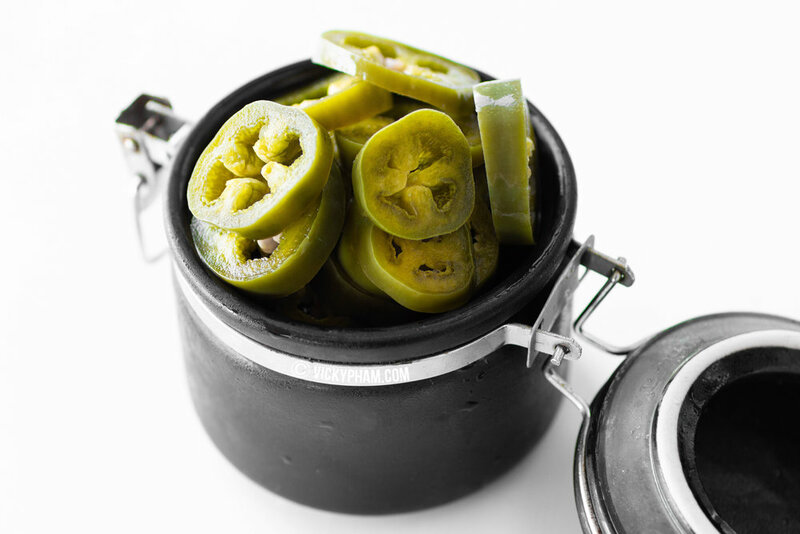 These pickled jalapenos have the perfect balance between spicy, sweet and sour. Best of all, they have a crispy texture that you won’t find in any store-bought pickled jalapenos. I use these pickled jalapenos as a condiment in many noodles dishes (see links below). So when it comes time to making a batch, I usually double or triple the recipe to ensure I'm always covered. They are so yummy, they are worth the heartburn. If you don’t make any of these Asian noodle dishes, add these tasty pickled jalapenos to your nachos! They are nothing like your mushy pickled jalapenos at the movie theater! Slice jalapenos into 1/4 inch thickness. Place sliced jalapeno in colander with large boles and give it a good shake so that the most of the seeds fall through. If you have don't have a colander with large holes, use any large bowl and shake. Remove the jalapeno slices, leaving most of the seeds at the bottom. Place jalapenos in large 32 oz jar/container with an airtight lid. In a medium-size sauce pan, add water, vinegar, sugar and salt. Heat on high until it comes to a boil then immediately turn off heat. Give it a quick stir to ensure everything is dissolved. Allow the pickling liquid to cool off to a warm temperature. We don't want boiling hot liquid, as it will cook the jalapenos too much. Once liquid has warmed, pour over jalapenos. Make sure to push the jalapenos down into the liquid. Seal and place in fridge. The jalapenos should be ready in four hours. For faster pickling, pickle at room temperature then store in the fridge. These pickled jalapenos are good up to one month. OTHER ASIAN CONDIMENTS YOU MAY LIKE!